Did you know that the equivalent of £6,000 worth of perfectly edible food is thrown in the bin every year by each small hospitality/food retail business in London? Whilst, at the same time, UK based SME’s in the hospitality sector, are overspending on their energy bills by nearly £92 million per year. This is a result of inefficient technology and old equipment. Recently, environment and climate issues have hit an all-time high on the public agenda with an increased awareness of food waste, plastic pollution, climate change and sustainable food consumption. So, what can you do to help overcome these issues? Advance London supports businesses to develop, pilot and implement new and innovative circular business models. On Tuesday 30th October, you will have the opportunity to join the Advance London advisors for a practical and interactive workshop, that will allow you to take a fresh look at the resources flowing through your catering business. Throughout the workshop, you’ll receive practical guidance on how to apply the circular economy principles. You’ll hear compelling case studies and interventions from industry experts and circular solutions providers and have the opportunity to network and collaborate with like-minded businesses. Is it time to take a look at your sustainability agenda? 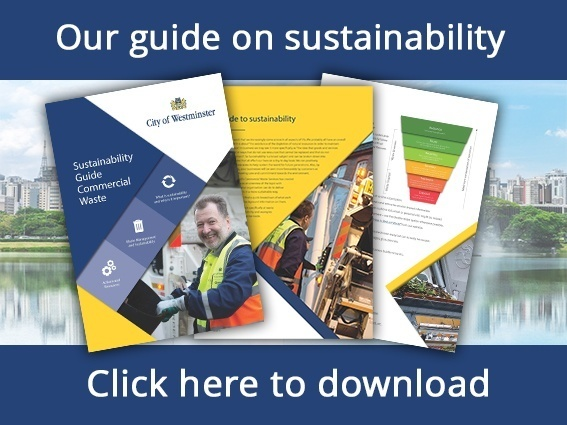 We have created a three section sustainability guide, in section one we outline the importance of sustainability by addressing the main six areas: climate change and energy, biodiversity, transport and connectivity, water management, building materials selection and purchasing, waste management and recycling. In section two, we draw from our extensive experience of waste management, to provide you with useful examples and practical advice on how you can improve your waste management. Section three provides you with resources that you can take away to help improve your business’ sustainability.